Selecting the style of trench you want. Trenches have been around almost as long as siege warfare has! They are a great addition to your force and can be a lot of fun to play games with. 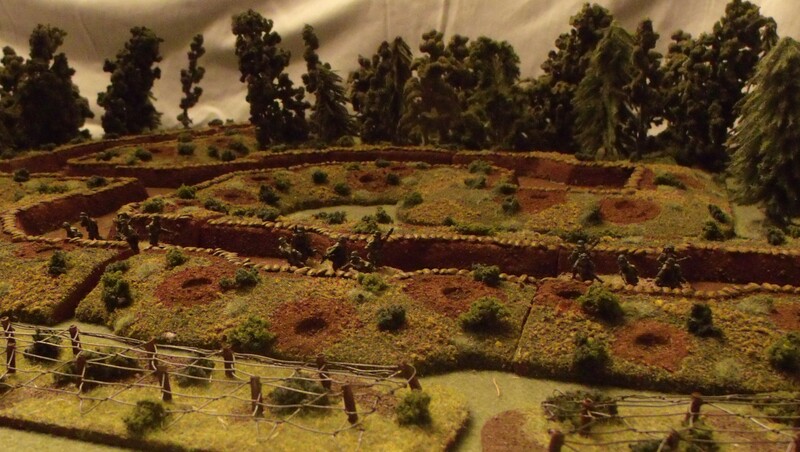 Whether you decide to use pre-made trenches (like ours) or make your own, adding personal details to them is very easy and well within the abilities of most gamers. If you can do a nice looking base then you can make a nice looking trench. The first step is deciding what you want them to look like. A very wide range of materials are used in real life to construct trenches, so this gives you a broad choice of styles to model. This article is intended to help you make that decision by showing you a few options that are very simple and easy to make. The most common and easiest to make is the plain trench. All trenches start out this way and anything else is a result of further improvements to the trench by adding revetments. A little glue and some sand is all you need to make this bare-bones version. Wicker Revetments have been around as long as trenches have. The easiest way to do them in 15mm is to use some coarse fabric to simulate the woven branches. Log Revetments look really nice and can be made with twigs that come from your yard. Plank Revetments can easily be made by cutting planks from balsa wood. Corrugated Revetments can be made from textured plastic or thin metal. The parapets are another thing to consider which can have a huge impact on how the trenches look. We like to use sandbags because it helps to break up the outline of the trenches by giving them more of a random appearance. The same thing can also be done with logs or even just piles of dirt. It all just depends on what you like, and what fits your needs the most. Now that you have hopefully decided on what style or styles to use in making your trenches, the next article in this series will expand on the details of how to do it.